Try as he might, he could not account for it, this feeling of depression and foreboding that had taken possession of him. This is the feeling that weighs upon young Frenchman Joseph Timar on his arrival in Libreville, Gabon, to take up a position on a logging concession in the interior of the country. Finding his progress delayed, Timar spends his first few weeks in the country hanging around the Central Hotel, where ‘the click of billiard balls and the chatter of the card players, [is] just like any French provincial café.’ Timar begins an affair with the proprietress, Adèle, and when she shoots a young porter, it quickly becomes apparent that the colonial authorities have no interest in bringing her to justice. These surroundings which at first had seemed to him so appalling and which he had loathed with all his heart – he was now seeing them from a different angle. He had grown familiar with all their aspects and much that had struck him as absurd or ugly no appealed to him in a curious way. By the time Timar ventures into the interior with Adèle to take over the logging concession, he has entirely assimilated the habits of the colon, beating and threatening a boatman and taking advantage of a young village girl. Violence, it is made clear, is an everyday occurrence, barely worthy of comment; a necessity for the maintenance of the colonial system. To this extent, the novel provides a scathing portrait of the colonial community, as corrupt, racist and debasing even to its own foot soldiers. However, while the portrayal of the settlers in unflattering, the same can be said of the depiction of the native population, who, seen through the eyes the novel’s protagonist, are viewed as entirely Other; unknowable and mostly unspeaking. The language in Stuart Gilbert’s translation of 1952 is ugly and dated, and at times the entrenched racial attitudes of the protagonists appear to creep into the narrative voice of the novel itself. Timar wondered what, if anything, [the oarsmen] thought about him personally, or if all white men were alike to them. As for him, it was the first time he was observing blacks otherwise than as decorative figures. [. . .] Today he was looking on them as human beings, individuals with lives of their own, and just now this seemed quite simple, thanks, perhaps to the primeval forest, this dugout, this river that for untold centuries had borne such primitive craft seaward. We are accustomed to look upon the shackled form of a conquered monster, but there – there you could look at a thing monstrous and free. It was unearthly, and the men were ‒ No, they were not inhuman. Well, you know, that was the worst of it ‒ this suspicion of their not being inhuman. It’s unsettling to be transported into the minds of characters for whom this revelation is necessary, and, while it provides an insight into the colonial mentality, the lack of distance between the attitudes of the characters and the narration, makes Tropic Moon an disturbing read. The second issue with Tropic Moon has nothing to do with colonial or racial politics, but rather with whether, as a novel, it is any good. In his introduction to the later NYRB edition, Norman Rush reckons it among the best of Simenons roman durs, but I find it hard to agree. In Simenon’s best work, the narrative develops organically, sparked by a single incident and driven by the flaws of the characters. This is not the case in Tropic Moon. The best parts of the book are those that revolve around the characters and ambience of the Central Hotel. Simenon is, of course, adept and sketching such a milieu, and the routines, petty jealousies and sexual dalliances of the characters are skilfully drawn. The problems really begin when, following the death of her husband, Adèle and Timar travel into the interior to run the logging concession. The episode seems a contrivance: are we really to believe that the insouciant Adèle, in her clinging silk dresses, really wants to relocate to the jungle? It allows Simenon to share the impressions of his African adventure, but does little to advance the plot and dissipates the claustrophobic atmosphere which has been built up. It’s hard not to feel that the novel would have achieved a greater degree of tension had Simenon forsaken travelogue for a more intense focus on the characters and locations of the early chapters. Instead character and narrative plausibility are sacrificed in order to drive home the author’s thoughts about colonialism. Tropic Moon is, then, an uncomfortable and unsatisfying read, one perhaps of more interest to students of colonial literature than to casual readers of Simenon. First published as Le Coup de Lune, 1933. 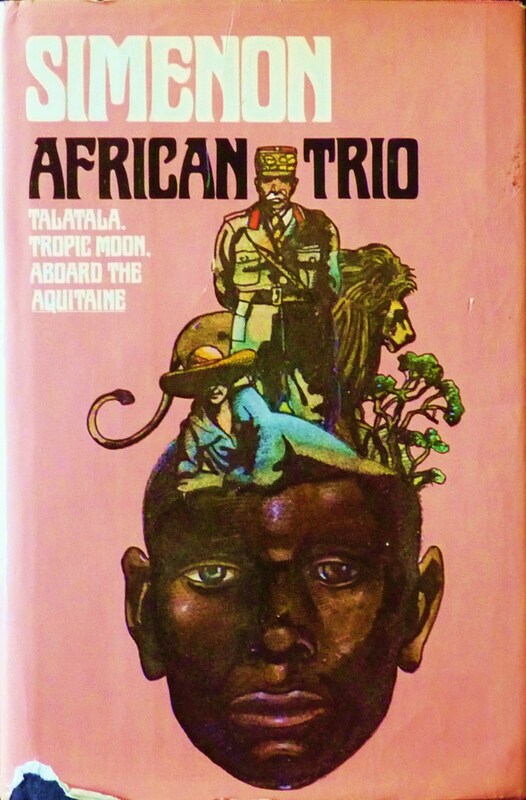 Published as African Trio alongside Aboard the Aquitaine and Talatala by Harcourt Brace Jovanovich, 1979. Translation by Stuart Gilbert. Gilbert’s translation was originally published by Penguin in the volume In Two Latitudes in 1952. [*] For an account of this episode see Pierre Assouloine’s biography, Simenon pp.114–118 and the introduction to African Trio.